The Zentyal Development Team proudly presents Zentyal Server 4.2, a new release with native Microsoft® Exchange protocol implementation and Active Directory interoperability. This release is based on the newest Ubuntu 14.04.3 LTS to provide the latest updates. It also integrates Samba 4.3.1, with lots of improvements for Active Directory services and support for Windows 8.1 and the newest Windows 10. I created this psot https://forum.zentyal.org/index.php/topic,25556.msg96628.html#msg96628 and I would like to know if this problem gets fixed in this release. Sorry to ask, as this feature is very important from all of us and I get stuck on this setup c'ause couldn't get it setup correctly on the Zentyal 4.1. As a Zentyal enthusiast here in Brasil, I must say that the version 3.4.8 was undoubtedly the best version ever [well, at least for me, I've got everything working fine, not a single fault]. This seems not to be a Zentyal problem, authentication against a Zentyal AD work. You've got post in the thread! 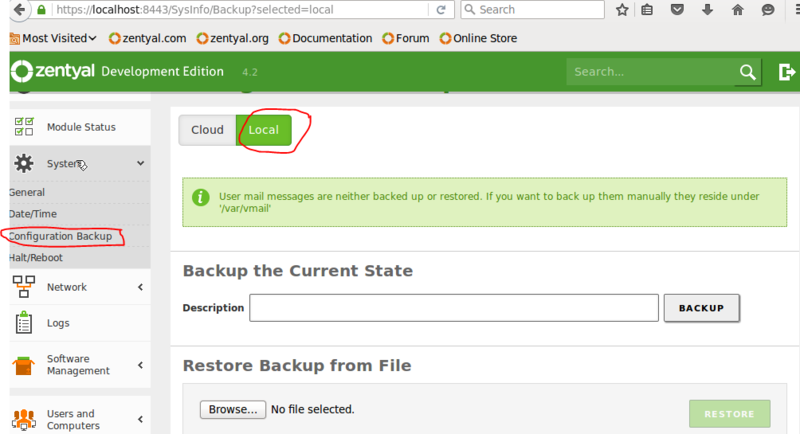 Is Zentyal now using all Ubuntu gcc-packages as base or provide it's own again like in 4.1? This is a crucial problem when trying to extend Zentyal with software like WebVirtMgr! Guys why in this version(Development 4.2) there is no Backup files? In version 2.0 (currently use) there is Backup files option under system. Please help, i can't schedule my backup. That's for backup configuration not backup files. You are right, there is no more options to configure how local backup to be made but there is still option to backup your system. 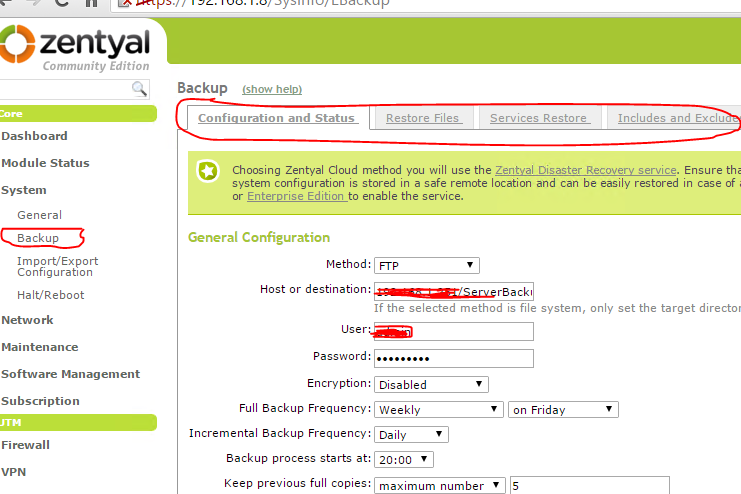 Beginning with Z 4.0, they drastically reduced the functionality of the Zentyal. There are many other distros that have extended options for backup configuration (NethServer - AiO Server; Endian - UTM; ...). You can try if you want to be "up to date" (Z 2.0 is stable but to old and you are not satisfied with Z 4.2). Is Z 4.0 can support windows 10 active directory and domain directory? Because Z 2.0 can only support windows XP that's why i want to upgrade my server. And can you give the download link of Z 4.0? I really don't know. I use Z 4.2 as Multidomain Email Server in DMZ (with Endian as UTM). But according to this: https://wiki.zentyal.org/wiki/Zentyal_4.2_Announcement, it works. I am talking to Z 4.0 . I need backup/restore files that Z 4.2 don't have and Z 4.0 have. Do you have any download link of Z 4.0? I know, but I don't think win 10, win 8 will work. 16 Mbps ISP link is conncted Netwok switch for this switch 2 zentyal firewall is connected(3.2 and 3.4), Zentyal firewall 3.2 is occuping the more bandwidth (11 mbps), Other firewall 3.4 occuping the 5 mbps. Is there any option to limiting the bandwidth firewall whic is occuping the more bandwidth?. Is Zentyal still alive? No news for quite a while now, are they working on zentyal 4.3? Good day zentyal users! Does someone know already how to import bulk users using script? There's availble script but it was no longer work in Z 4.2 .